Take a look at this painting, called, “The Numbering at Bethlehem”. Looks odd, doesn’t it? I mean, it doesn’t look much like Bethlehem. It doesn’t even look particularly religious. In fact, it looks quite a lot like an old European town. That is what it’s intended to look like! 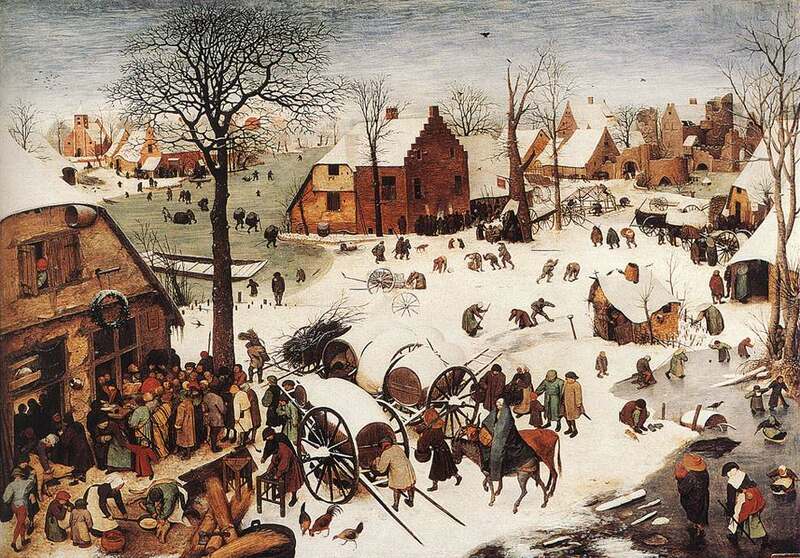 It was painted by Peter Bruegel, a 15th century Flemish painter. In this little snow-covered community, the streets are filled with activities of the season. There’s a wreath over the door of one shop, where folks meet, haggling over prices. There’s a young man flirting with a young woman. A farmer and his wife are butchering a pig in the foreground, probably for someone’s Christmas feast. (That, if nothing else, gives away that this is no Jewish town!) There’s a worker struggling with a cart of firewood. Children are playing and skating on a frozen little pond. A crowd meets at the census office, preparing to be counted for tax purposes. It looks like a typical winter’s day in mediaeval western Europe. It doesn’t look much like Bethlehem at all – just Christmassy, in a muted kind of way. But look a little closer. Zoom in, if you have to. You’ll see, in the middle of the road, “unnoticed by passersby, a humble, stooped-shouldered man carries a bag of tools, and leads a small donkey who is trudging through the snow. And on the donkey, shivering from the cold, an old blanket thrown over her shoulders, is an unassuming young maiden. It is Joseph the carpenter and his young wife, Mary, come from Nazareth to pay taxes. “Is this not the way that Christ comes to us, not just on Christmas day, but every day? Moving in, silently, without fanfare or burst of trumpet, coming into the midst of life in all of its everydayness and clutter and workaday concerns, arriving, as Paul said, ‘like a thief in the night.‘ Here is God, touching and loving earth in the form of a baby, born to lowly parents in a stable. “Look again at the Bethlehem scene. Look with eyes of expectancy and faith. Can you feel the throb of joy underneath this everyday scene? As John the Baptizer told us at Christ’s first advent, ‘There now stands among you, often unknown to you, the one who is your salvation’ (John 1.6-18, 19-28). Rejoice, for even now God is moving silently across the canvas of our lives to deliver us.” (William Willimon, Between Two Advents, 1977). “Today in the town of David a Saviour has been born to you; he is Christ the Lord” (Luke 2.11, NIV).